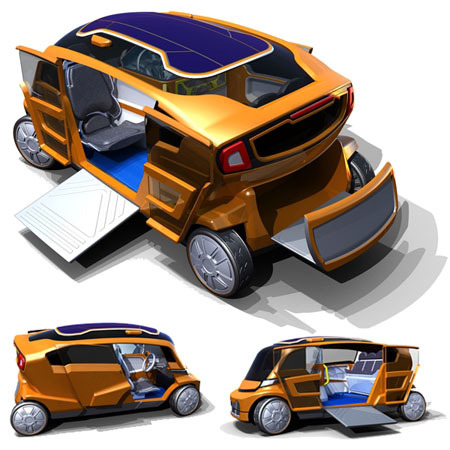 Melbourne RMIT University student Damian Lucaciu, has developed his concept design, Melbourne Taxi 2010 has been adapted to suit and change the iconic New York taxis. The flow flat sliding wheel chair ramp allows easy and efficient access for the disabled and those confined to a wheel chair. A few of the of ingenious concepts of the car include a hydrogen fuel-cell and two low-lying battery banks which work together sending power to the four wheels (each has an electric motor) by generators. The roof the the car also includes a solar panel to help keep the charge. “Boomerang Hubs” are being developed for the taxis to quickly recharge. A maxi – taxi version is also being developed to hold up to 6 passengers and to hold more luggage.